The Moth – you move me! Over and over again. The feeling I get from listening to this story will stay with me for a long time. 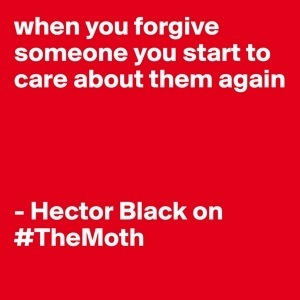 I actually listened to it while driving to a customer, and I have to say this: The story Hector Black tell, pack such a punch, that I recommend you just sit down and listen to it, not trying to focus on anything other than listening. You most definitely should not be on any moving vehicle, if you are the driver of it! The power of a story never cease to surprise me. And this one was powerful. Oh so powerful. What story would you want to share with the world? Det här inlägget postades i #English, 2014#Blogg100, Event och märktes #Blogg100, Hector Black, power, powerful, story, The Moth av Helena Roth. Bokmärk permalänken.